CHART of the SANDWICH ISLES - FISHER, H.
Title : CHART of the SANDWICH ISLES. Map maker : FISHER, H.. Size : 7.2 x 9.4 inches. / 18.2 x 23.9 cm. Description :Uncommon & detailed map of the Hawaiian Islands, indicating elevation with hachure. Includes names of cities, mountains and bays, noting the death of Captain Cook in Kearakekua Bay, on the southwestern side of the island of Hawaii. An inset map shows Oahu. 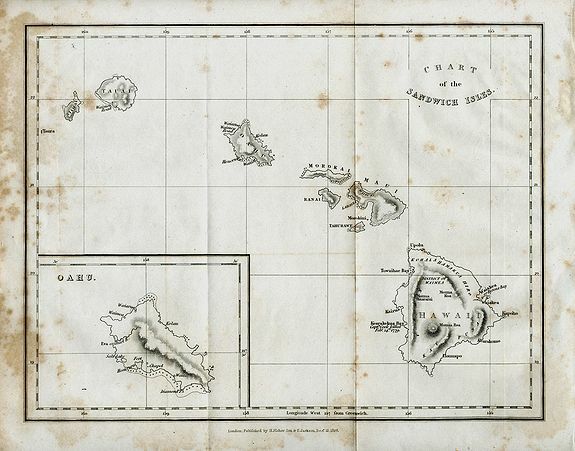 Published in "Narrative of a Tour through Hawaii" by William Ellis in 1826. By H. Fisher, Son & P. Jackson. Condition : Good dark impression. Uneven toning and spotting, mainly to margins. Two vertical folds. Faint soiling, mainly to margins. Top right corner slightly creased. Good example of this uncommon map.